Karpel Solutions understands that prosecuting attorneys work in a demanding environment including shrinking budgets, public skepticism, and increasing caseloads. When it comes to the effective administration of justice, let’s face it -- numerous paper-based processes and tedious manual tasks steal your precious time and keep you from serving your community. PROSECUTORbyKARPEL will revolutionize how your office handles these challenges. 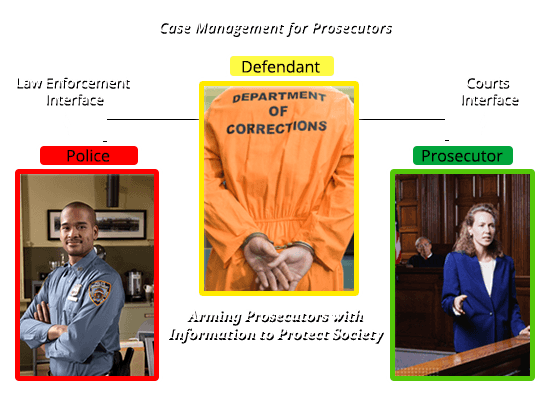 PROSECUTORbyKARPEL is an industry-leading modern criminal case management program that is utilized by some of the largest, as well as some of the smallest, prosecuting attorney offices throughout the United States. Our 20 years in the legal industry have allowed us to help numerous offices eliminate paper files and redundant data entry using our fully-integrated, browser-based technology that is configurable by YOU to enhance your business practices the way you see fit. Thanks for putting together a great product. Even though we're still learning and fresh off a conversion from DAMION, we are very happy with how easy and smooth it is going. Your support people have been great to work with. Karpel Solutions has demonstrated the ability to build software to conform to Missouri law and procedure, build interfaces with law enforcement, and respond quickly to the wants and needs of their customers. Thank you for hosting the CA User Group meeting yesterday. I always find your meetings to be very informative and helpful, and I appreciate your openness to all of the user suggestions. PbK just keeps getting better and it is because of your continuous desire to improve the product. So thank you! Thank you for your patience during our training last week. We were a little apprehensive…but training went very well and I can see why you do it that way. I want to thank Karpel for the tremendous job they did converting our data. We now have a data base that is usable and helpful for every employee of the office...Most importantly, Karpel has provided an effective tool that increases our ability to prosecute crime in our county.